Young in Heart is odd for a late ’30s film. While the film production code dictated that criminal always have to be punished by the end of the movie, this story focuses on a whole family of professional criminals who change their ways and find redemption. It seems the screenwriters were able to skirt the rules by neatly placing the conning and cheating into the backstory. The film opens with the Carleton family in Monte Carlo, where the father has been cheating at cards and the son is about to marry a homely girl worth $3 million. The manager of the hotel finds out who they are and gets them kicked out of the country. Penniless, they head toward London and meet a rich and lonely old woman on the train. After they help her following a train wreck, she invites them to stay with her at her mansion in England. The two men in the family get real jobs for the first time in their lives, and the children find out the meaning of true love without consideration for money. Eventually, even mom comes around to the idea of being respectable. 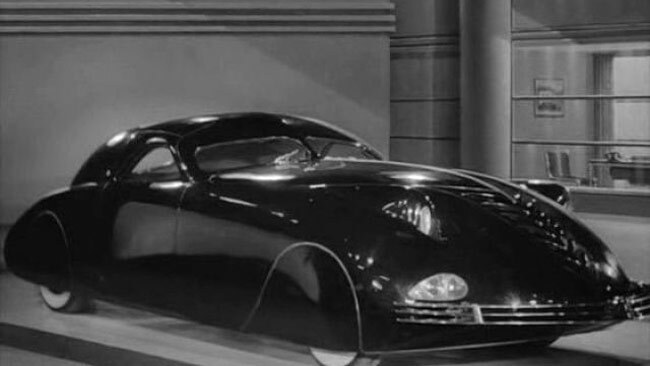 This film is also know for an appearance by the Phantom Corsair, a one-of-a-kind car that was designed and made for Rust Heinz, of the Heinz ketsup family. In the film, it appears at the “Flying Wombat” the car that Sargent Carleton gets a job selling. The true car was ahead of its time design-wise, as it was highly aerodynamic, but was also the last word in luxury, with a built in bar and leather-upholstered seats for six.